On teams as deep and offensively gifted as the Winnipeg Jets, oftentimes bottom-six players get lost in the shuffle and have minimal impact. Not Brandon Tanev, however — his one-of-a-kind game has made the spark plug forward an integral, productive member of the squad. Tanev is a bit like a Swiss army knife: he possesses a number of tools all tucked into a compact package. Firstly, Tanev is tenacious and relentless. He has no setting other than overdrive and plays every shift like it’s his last, never phoning it in or giving less than total effort. He embodies hustle, grit, and hard work. His energy can spark the Jets when they’re sleepy. At 6-feet, 180-pounds, Tanev is far from the largest lad in the league, yet his physical edge is his calling card. His 80 hits this season have him tied with line mate Adam Lowry for the team lead. He’s dished out as many as 188 in a single season. Secondly, Tanev is fast — one of the fastest players on the Jets — and has an explosive first step. He’s such a whirling dervish that he’s earned the moniker “Tasmanian Devil.” His speed allows him to win puck battles, pressure opponents to act before they want to, and force turnovers that lead to chances the other way. Brandon Tanev gets his painful shot block out of the way early. Nobody, and I mean nobody, takes more physical abuse than the #NHLJets forward. Through 30 games in 2018-19, Tanev has already blocked 35 — most among Jets’ forwards — and is on pace to exceed the 56 shots he blocked in 61 games last year. Dubbed “TLC,” the line can crash, bang, and grind opponents down physically, but thanks to their speed and hard-noses, can also produce their fair share of offence. This means, in addition to worrying about getting banged around, opponents also have to worry about the line banging one in. With 12 points through 30 games, Tanev is set to shatter his career-high of 18. With six goals, he’s just two goals shy of matching his last year’s output. His tallies aren’t flashy like Laine’s or Nikolaj Ehlers’ — they’re more often of the greasy variety and a result of his or his line mates’ hard work. His hat trick last March against the Boston Bruins is a good example of his speed, dogged puck pursuit, and never-say die attitude. Tanev also shines in big moments. 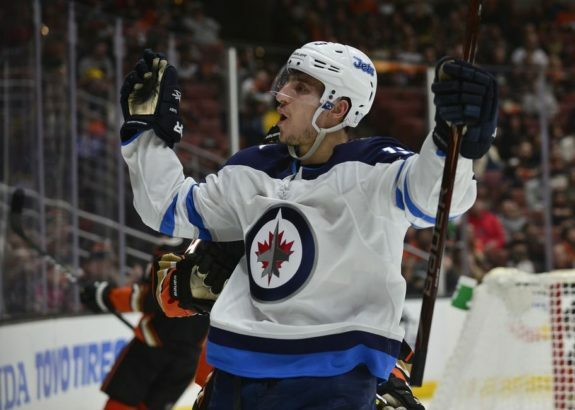 In the Jets’ run to the 2017-18 Western Conference Final, he put up four goals and two assists for six points in 17 games, scoring in three straight during the Jets’ second-round matchup against the Nashville Predators squad, a clash between two titans that went the distance. Tanev signed a team-friendly, one-year-deal worth $1.15 million back July, but if he keeps playing like he has, will likely seek a multi-year contact worth upward of $2 million annually. That could pose problems for the Jets, whose impending cap crunch is well-documented. Laine and Kyle Connor’s entry-level contracts will be up at the end of the year. Between the two of them, their contracts could command between $16 and $20 million annually. When you add that figure to the money already dedicated to Dustin Byfuglien, Nikolaj Ehlers, Connor Hellebuyck, Bryan Little, Adam Lowry, Mathieu Perreault, and Blake Wheeler — along with the need sign top-pairing, shutdown defensemen Josh Morrissey and Jacob Trouba to long-term deals — it’s obvious there’s not a lot of wiggle room to offer Tanev more, even though he deserves it. Jets’ General manager Kevin Cheveldayoff must do everything in his power to retain Tanev, though. After all, it’s not often you can get a Tasmanian Devil on your side.